franchise family and secure your future. With our training and support, you'll have the tools to build a successful Mr. Handyman business. Our Right Start ™ program will have you on solid footing from day one. 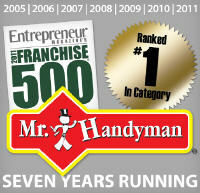 Right Start covers everything from setting up your business to placing your first Mr. Handyman ads. And as a Mr. Handyman owner, you'll have access to Toolbox™, our proprietary management software that simplifies every part of your business. With so many risking investments these days, doesn’t it make sense to consider #1 first? If you qualify for a Mr. Handyman franchise, we'll invite you to a Meet The team Day at our home office in Ann Arbor, Michigan. It’s your day to get to know us and to get answers directly from the people who are committed to your success. If you make an informed decision, we know that Mr. Handyman will be your first choice. Not every homeowner is a professional handyman with time to spare. These time-conscious baby boomers and two-income families want a "one-stop" solution for every major and minor home repair. Their professional choice is the same as yours— Mr. Handyman, America's trusted home repair franchise. We fill a unique need by helping prioritize and efficiently manage repairs that increase home values.